Meet Boniface. He’s a refugee from Rwanda who came to the United States only a couple of years ago with the help of Church World Service. 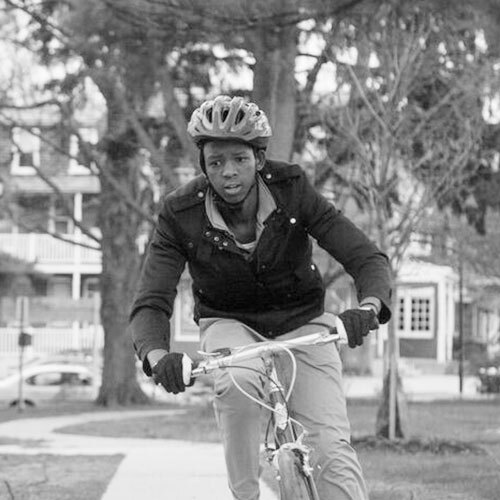 We first met Boni when he signed up for our Earn-a-Bike class. Speaking little English, we worked with Boni to make sure course concepts were understood, often using some creative hand signals! Now, Boni is an employee apprentice. He is learning valuable skills while earning a paycheck (and opening his first bank account!). Boni’s eyes light up when he’s given a task, and he works hard to do it right the first time. He helps with our Earn-a-Bike program, translating when needed, and connecting with students. He is a familiar face to kids of all different backgrounds, and he is making an important impact on his community, all the while building STEM skills which are transferable to other career paths. It is not uncommon to see Boni roaring around the Reservoir Park on his bike. You’ll see him stop, adjust a few things, and then go on ripping around. When he sees a kid in need of assistance, he always stops to help make their bike safer. Sometimes they don’t speak the same language. But, somehow bikes can create opportunities for understanding each other, even across language and cultural barriers. Theses days, Boni spends his time between school, The Common Wheel, and Army ROTC training. (He’s got his hands full!) But Boni always makes time for The Common Wheel and for Earn-a-Bike. We’ve gotten to watch Boni grow into a strong young man who still has a bit of a twinkle in his eye. It’s kids like Boni that mean so much to us because we can see the impact we are having on the community that reaches far beyond just Lancaster, or even bikes, but to populations who have come to build a better life for themselves. Though we may provide a few tools, it is kids like Boni who continue to further our mission on a daily basis.